How efficient is YOUR healthcare environment? Healthcare providers (hospitals, clinics and outpatient care facilities) are faced with severe pressures to improve patient satisfaction, quality of care, and the financial health of the organization. One of the biggest problems faced by hospitals is how to reduce the errors that take place every day—errors that are measured not just in dollars, but also in patient safety and lives. Better technology leads to better care. Without mobility in your healthcare facility, patient data is often collected manually at bedside, then entered into the system later—after countless distractions and interruptions. Your staff can’t afford such inefficiency, and you can’t afford the risks that come with error-laden, “double-touching” of patient data. Whether you have nurses who need to identify patients, administer medication and monitor patient vital signs, physicians who need to access patient records and order tests, or administrative staff involved in taking inventory, Inovity has comprehensive solutions to meet your healthcare facility’s needs. Put the tools your healthcare workers need in the palms of their hands. Literally. In the mission-critical environment of healthcare, delivering the very best in patient care requires doctors, nurses and other caregivers to be accessible and instantly able to reach colleagues as well as access a wealth of data. When you arm your staff with mobile data collection, management and printing solutions, you give them the double- and triple-checks necessary to reduce errors dramatically. Nurses can scan patient wristbands, medications and their own ID cards in seconds, ensuring that the right patient receives the right medication, the right dose, by the right route, at the right time. And, since patient records are updated in real time, the next shift can immediately see which medications were administered by the prior shift, and when. Specimen labeling at bedside with mobile printing significantly reduces sample errors, resulting in improved and accurate dignoses. Mobile data solutions in hospitals or healthcare facilities significantly improve productivity by eliminating manual, paper-and-pen, error-laden processes, sample misidentification and inaccuracies. Eliminating such processes dramatically boosts the productivity of staff that is often overworked, and removes the possibility of dangerous, even fatal, errors inherent in manual procedures. The error-proofing that results from procedure automation helps increase the quality of patient care, reduces the potential risk and liability, and increases the confidence of healthcare workers. Healthcare workers are always on the move. Can you find them when you need them? Mobile computing in a healthcare setting requires more than a notebook computer on a cart. True mobility means using handheld or wearable devices with wireless communications for real-time connectivity, and a next-generation, secure mobile computing infrastructure. Eliminate the need for your staff to carry separate pagers and cell phones within your facility and save thousands by dropping your annual cellular or pager contracts. By implementing a Voice over Wireless LAN solution (VoWLAN), you use your existing TDM or IP-based PBX phone system to connect your mobile workers throughout the building—without additional cell phone costs or contracts. Your staff is your lifeline to patients. 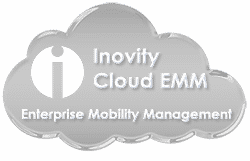 Healthcare mobility solutions from Inovity are the lifeline between your staff and your business systems. How can mobility and automatic data collection improve your healthcare facility? Request a System Consultation today to learn how mobility can improve your hospital operation—and save lives.